I can’t remember when the Isle of Harris and the Isle of Lewis made it onto my bucket list of landscape photography locations. I’m not entirely sure what inspired me to want to go there. Maybe it was a Thomas Heaton video from Harris or seeing some holiday photographs from my sister. Maybe it wasn’t just one thing, but rather it came through a gradual consumption of media and photographs from this most stunning Scottish location. No matter how it made it on to my list, I had decided that early on in 2018 that I was committed to making the long journey back into my homeland and onwards to the Outer Hebrides. Time is precious and the amount of time I can normally commit to just doing landscape photography is limited. Things would be different on this trip though. Where my longest landscape photography adventures had normally been limited to a long weekend, this trip would see me commit 9 days. Nine whole days of landscape photography! Actually, it was going to be nearer to 5 days. From Devon, it’s a two-day drive there and a two day drive back. It is over 650 miles one way, and you also need to get a ferry for part of the journey. That aside, 5 days is way more than I normally get to allocate to my passion. Besides, the journey wouldn’t be so long as I had a mate coming long with me. Plenty of time to catch up and chat. I also set myself some clear priorities. This trip was going to be all about my photography. The weather gods hadn’t been kind to me in 2018 and I felt I wasn’t taking the images I knew I could. This trip was going to change that and I was going immerse myself in landscape photography. With the decision to immerse myself in stills photography, I also made the decision not to make creating content for my YouTube channel a priority. The stills photography would be the top priority. My goal for the trip was to capture great landscape images. However, I do love creating content for my YouTube channel so I wasn’t going to go all the way to Harris and Lewis and not film anything. Our plan was to get as far as Glencoe on the first day. With a bit of luck, we’d get there before sunset and grab some shots. Fortunately for us, we did and you can see the results in the blog post Glencoe - One Location, 3 Compositions. Our luck the next day soon ran out though. Not only was the weather not suitable for any sort of landscape photography, but the winds had picked up to gale force and it looked like the ferry crossing would be cancelled. Well, it appeared as if the captain of the boat wasn’t going to let a thing like the wind stop him from sailing, so we eventually left Uig at 9 pm. There wasn’t going to be a sunset shoot on Harris that day, but we were at least going to be making the crossing that evening. It was dark when we arrived in Tarbert, and it was dark when the alarm went off the next day for the first of our sunrise shoots. Having seen nothing of Harris so far we set off in the dark and headed to Luskentyre beach. This is the point where I move the storytelling from the blog to the vlog. You will have noticed in the video that I didn’t talk about some of the locations we visited. I only showed the photographs. As I said earlier though, I really wanted this trip to be about immersing myself in my photography and not having to worry about talking to the camera. So you have a more complete picture (excuse the pun) of my trip to Harris and Lewis, the next few sections of this blog post will feature all the images you saw in the video, along with the camera settings, and where they were taken. I hope you will find this information useful and the photographs inspiring. If you are looking for a bit more inspiration, and more details on some of the locations I visited, be sure to check out Dougie Cunningham's excellent book Photographing Scotland. No visit to Harris would be complete without going to Luskentyre. I found the photography here so inspiring that I photographed it almost every day. North Harris from Luskentyre Beach, Isle of Harris - Nikon D850, Nikkor 16-35 mm f/4 at 19 mm, f/13, 3 seconds at ISO 200, Lee Filters Circular Polariser and ND Grad. Pull of the Tide at Luskentyre Beach, Isle of Harris - Nikon D850, Nikkor 16-35 mm f/4 at 19 mm, f/13, 2 seconds at ISO 64, Lee Filters Circular Polariser and ND Grad. Dunes of Luskentyre Beach #2, Isle of Harris - Nikon D850, Nikkor 16-35 mm f/4 at 20 mm, f/13, 1/5th second at ISO 64, Lee Filters Circular Polariser and ND Grad. This interesting location is easy to access as it is right beside the road. Take some wellies though! Stormy Saltings, Isle of Harris - Nikon D850, Nikkor 16-35 mm f/4 at 16 mm, f/13, 15 seconds at ISO 64, Lee Filters Circular Polariser, IRND and ND Grad. The S in Saltings, Isle of Harris - Nikon D850, Nikkor 16-35 mm f/4 at 35 mm, f/13, 15 seconds at ISO 64, Lee Filters Circular Polariser, IRND and ND Grad. Northon Saltings from Above, Isle of Harris - DJI Mavic Pro, 1/100th second at ISO 126, 26 mm at f/2.2. Not the easiest beach to get to, but worth the walk. Traigh Mheilein, Isle of Harris - Nikon D850, Nikkor 24-70 mm f/2.8 VR at 32 mm, f/13, 62 seconds at ISO 64, Lee Filters Circular Polariser, IRND and ND Grad. A spectacular coastline made even more impressive with the Stac a' Phris sea arch. Turbulent Water at Stac a' Phris, Isle of Lewis - Nikon D850, Nikkor 16-35 mm f/4 at 18 mm, f/11, 1 seconds at ISO 64, Lee Filters Circular Polariser and ND Grad. Stac a' Phris, Isle of Lewis - Nikon D850, Nikkor 16-35 mm f/4 at 20 mm, f/11, 2 seconds at ISO 64, Lee Filters Circular Polariser and ND Grad. Sunset at Stac a' Phris, Isle of Lewis - Nikon D850, Nikkor 16-35 mm f/4 at 21 mm, f/11, 5 seconds at ISO 64, Lee Filters Circular Polariser and ND Grad. The 2nd visit proved even more amazing than the first! Sunrise at Luskentyre Dunes, Isle of Harris - Nikon D850, Nikkor 16-35 mm f/4 at 18 mm, f/13, 1 second at ISO 100, Lee Filters Circular ND Grad. Sky Fire at Luskentyre, Isle of Harris - Nikon D850, Nikkor 16-35 mm f/4 at 18 mm, f/13, 0.6 seconds at ISO 100, Lee Filters Circular ND Grad, single image crop at 6:17. Another dramatic coastal location on the Isle of Lewis. Mangurstadh Stacks, Isle of Lewis - Nikon D850, Nikkor 24-70 mm f/2.8 VR at 52 mm, f/11, 119 seconds at ISO 64, Lee Filters Circular Polariser, IRND and ND Grad. There are so many beaches to photograph on Harris, but if you like patterns in your sand this one is well worth a visit. Tràigh Scarasta, Isle of Harris - Nikon D850, Nikkor 16-35 mm f/4 at 19 mm, f/13, 69 seconds at ISO 64, Lee Filters Circular Polariser and ND Grad. 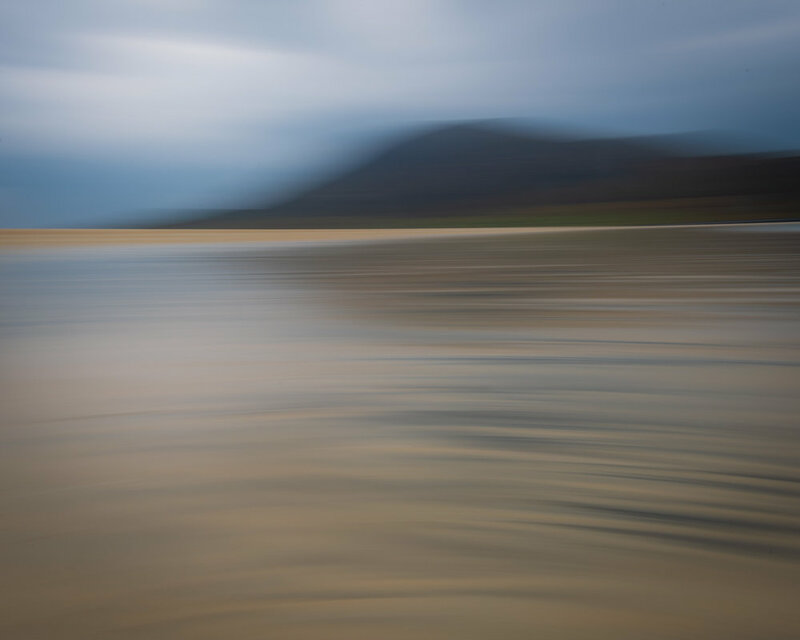 Tràigh Scarasta (ICM), Isle of Harris - Nikon D850, Nikkor 16-35 mm f/4 at 24 mm, f/22, 1/4 second at ISO 64, Lee Filters Circular Polariser and ND Grad. I know it’s another beach, but even in the wildest of conditions it’s possible to get an image at one of the many golden beaches on Harris. Tranquility at Luskentyre, Isle of Harris - Nikon D850, Nikkor 16-35 mm f/4 at 19 mm, f/13, 3 seconds at ISO 64, Lee Filters Circular Polariser, ND and ND Grad. 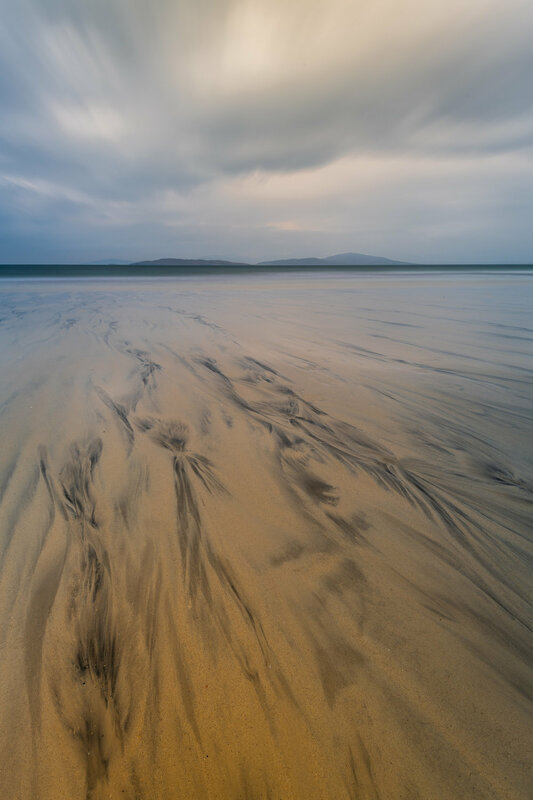 Sand, Wind and Time, Luskentyre, Isle of Harris - Nikon D850, Nikkor 16-35 mm f/4 at 25 mm, f/13, 25 seconds at ISO 64, Lee Filters Circular Polariser, ND and ND Grad. The Pastel Shades of Luskentyre, Luskentyre, Isle of Harris - Nikon D850, Nikkor 16-35 mm f/4 at 18 mm, f/13, 144 seconds at ISO 400, Lee Filters Circular Polariser, ND and ND Grad. Luskentyre Beach Panorama, Isle of Harris - DJI Mavic Pro, 1/50th second at ISO 161, 26 mm at f/2.2, 9 image stitch cropped at 6:17. After 5 whole days of photography, it was sadly time to go home. We were really rather lucky with the conditions we got. The Outer Hebrides aren’t exactly known for settled weather but we managed to make it out every day with the camera. Some days were definitely more challenging than others, but even in wild conditions this magical place had something to offer. As for the trip home ,that was similar to the trip up. The ferry was delayed due to bad weather so no chance of a sunset shoot back on the mainland, and the conditions the following morning were flat grey and overcast. As we headed down the M6 past the Lake District I didn’t even feel bad for passing it by as I had memory cards full of amazing images and video. I do hope this blog post and video has given you a sense of not only what my adventure was like, but also what it is like to photograph Harris and Lewis. It truly is one of the most amazing landscapes I’ve ever photographed. From its dramatic coastal locations, grand mountains and open moorland, it never failed to surprise me. There was a real sense of awe. I grew up in the highlands of Scotland and now live in Devon so I know a good landscape, but Harris and Lewis were something special. 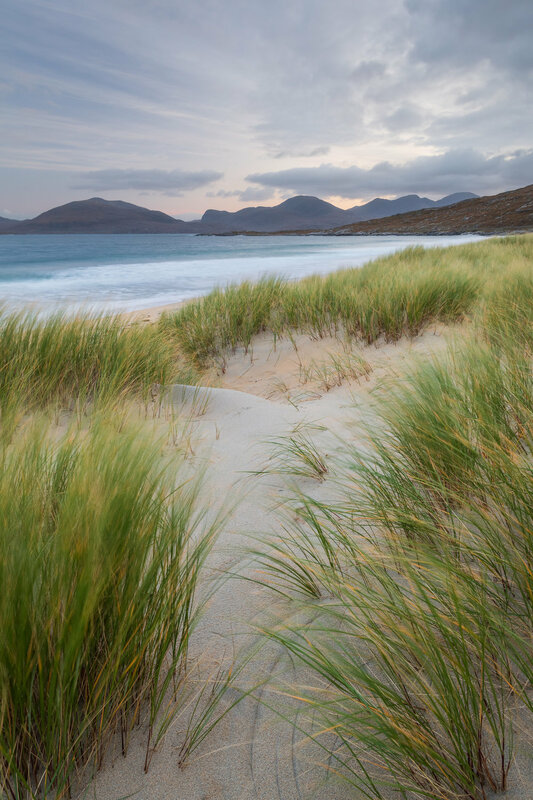 Are you planning a trip to the Outer Hebrides? Which photograph or locations was your favourite? What locations are on your bucket list? Let me know in the comments.